While many of us in the English speaking world are accustomed to having upwards of 20 different Bible translations to read, we often don't realize that there are still languages in the world that don't have even one translation in their native language. For one people group living in the arctic region of northern Canada that has changed. 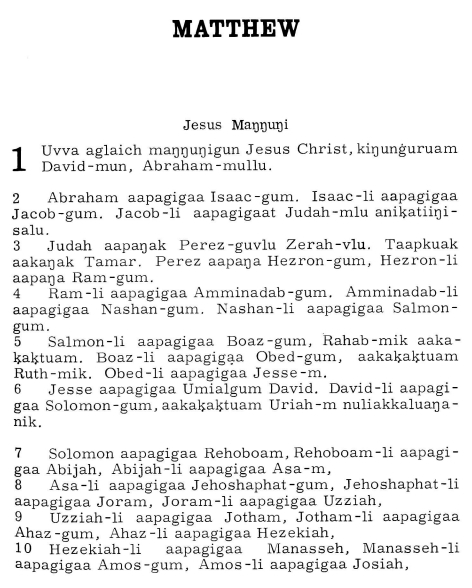 A complete Bible in Inukitut has been translated for the Inuit people who live in that region of Canada. The project began in 1978 with the completion of the New Testament in 1991 and the Old Testament this year. But even more interesting and exciting is that it was translated by the native speakers themselves rather than by white missionaries. Such an accomplishment is important since it means that the Inuit people will have a translation of the Bible not only in their own language, but one that was translated by those who truly speak and understand it. But adapting the Old Testament, with its litany of desert vegetation and animals, to an Arctic readership presented challenges.For one, there are no words in Inuktitut for “goat,” ‘’sheep” or “camel.” Those had to be written phonetically. And what do to about the 30-plus types of trees mentioned in the Bible when there are no trees of any kind for hundreds of miles in the Arctic? “We used a general term for tree,” explained Allooloo, “and then explained it in the footnotes.” The translation brims with footnotes and explications. The same word was used for “shepherd” as for someone who tends a dog team. “It’s like’baby sitter,’” said Arreak. Similarly, “pomegranate” is described as a sweet fruit with many seeds. This sounds like an exciting project. I think it also helps us to think once again about what we mean when we discuss "translation." As I always tell my Greek students, translation is not like playing connect the dots. It is more like decoding and even then that is only the beginning. 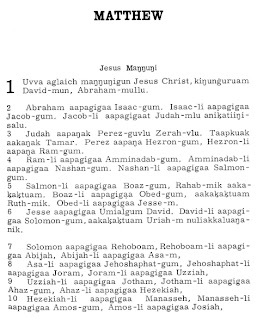 Read more about the Inukitut Bible here. Paul's Thorn in the Flesh Revealed!